Postcards of San Gimignano encourage many people to visit Tuscany. With 15 medieval towers and a great, thick, surrounding wall perched on a hill - appealing from both inside and out. Strolling through the towns narrow pedestrian streets lined with tall buildings on a hot summer's day is, for many people, one of Tuscany's most memorable experiences. Our pick of the best places to stay in San Gimignano range from a luxury haven in the town itself to a charming agriturismo just outside. The striking medieval towers were built by the wealthiest citizens of San Gimignano as they tried to outdo their neighbours. Can you imagine it there used to be 72 of them! The tallest one standing today is the Torre Grossa, built in 1298 and 54metres high. As well as the towers, San Gimignano's Duomo is worth visiting. The inside is lavishly decorated in 14th Century frescoes. The Palazzo del Popolo also houses some notable frescoes and other art works. There is a torture museum and an Archaeology museum. The medieval fountains, where people once collected their water, are also worth a look. This part of Tuscany still feels pretty rural. The roads wind in places and so your slow drive through reveals fields, orchards and vineyards amongst the green hills and terracotta towns. This area was once a large saffron producer, but today its main export is white wine: Vernaccia. Making a base at one our choices of the best places to stay in San Gimignano will ensure you're perfectly placed to fully appreciate this stunning location. 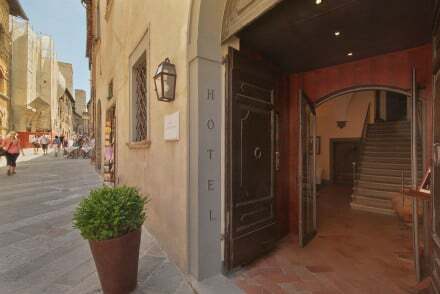 Carefully restored 15th Century townhouse, L'Antico Pozzo is one of the best places to stay in San Gimignano itself. It's been romantically decorated with four poster beds, ethereal drapes and wonderful frescoes. In addition the views are fabulous. If you want to let more of your senses to experience Tuscany one of the best places to stay in San Gimignano is Agriturismo Poggiacolle. This gorgeous farmhouse B&B is also a working vineyard and saffron farm. Rooms are 'rustic romantic' and there's an infinity pool and tennis courts, so it's far from basic. Glorious Tuscan landscape abounds at the majestic Mormoraia. Set on a farm, there's a real rustic feel about the place. The rooms combine charm with luxury and the hotel's restaurant serves up sumptous local cuisine as well as delicious home grown wine. La Collegiata, a former 16th century monastery, encapsulates the regions rich history and heritage. 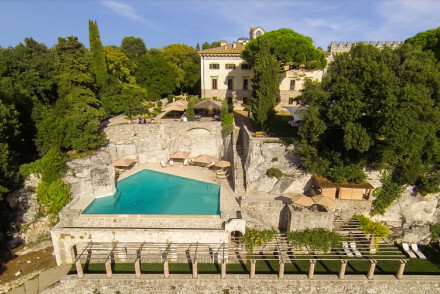 Nestled amidst beautiful formal gardens, the hotel offers charming rooms, a delightful restaurant in the monastery's former church and an excellent selection of Tuscan wines. If you're hoping for a relaxing Tuscan break and want to dodge the crowds, one of the best places to stay in San Gimignano is just outside of town - Borgo Pignano. This private estate is a haven of luxury. The bedrooms are palatial, you breakfast in a ballroom and there's a private cinema. They also run art and cooking classes, truffling expeditions and there are regular yoga sessions. The nearest airports to San Gimignano are Florence (43 miles) and Pisa (51 miles). A car is really useful for exploring the area so why not visit our online car hire partner Rentalcars. If your looking for summer sun then June to August is the best time to visit but also worth considering the autumn months from September to November, when the temperature is cooler but the grapes are in harvest. Call or email, one of our gurus for advice. Alternatively take a look at all our Tuscany recommendations. 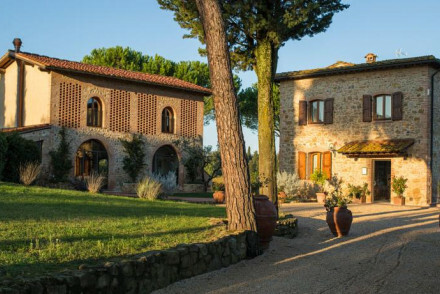 A beautiful hotel set on a Tuscan farm near San Gimignano. Rooms are tasteful and spacious with exposed wood beams and stone flooring. Lounge by the pool with vistas of sprawling Tuscan countryside or browse the vines and groves from which the hotel produces its delicious wine and olive oil. Foodies - The restaurant serves excellent traditional Tuscan cuisine, and tastings of the homegrown wine and olive oil can be arranged. 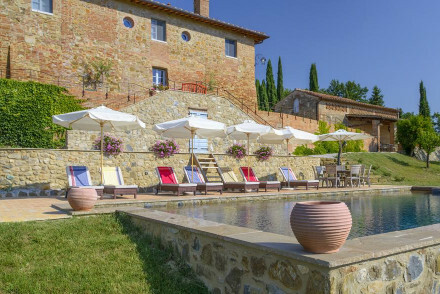 Romantic Break - A romantic Tuscan country retreat with simple and chic rooms, outdoor pool, hot tub, sauna and Turkish bath. Great walks - There are innumerable beautiful walks available through the Tuscan countryside. 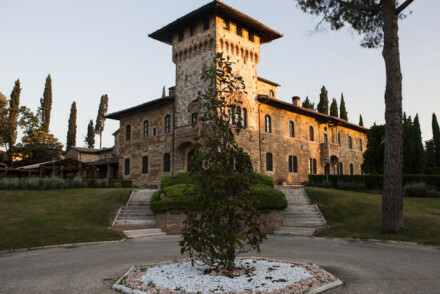 Sights nearby - The property is only fifty minutes drive from both Siena and Florence. 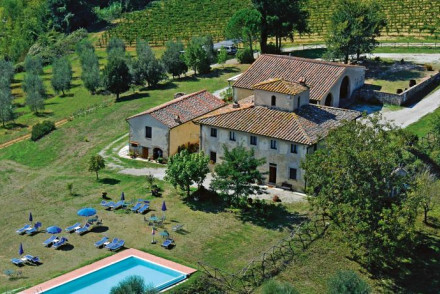 A classic Tuscan farm offering idyllic views over the surrounding vineyards. Traditionally dressed rooms feature wrought iron bed frames, beamed ceilings and tiled floors. The restaurant is a real draw with dishes created by Michelin starred chefs. There is also a picture perfect pool. Country Escape - A secluded 18th-century farmhouse surrounded by olive groves and vineyards. Sights nearby - Visit the towers of San Gimignano, declared part of the World's Architectural Heritage by UNESCO. Great walks - Take scenic strolls through the surrounding countryside.